Fall season offers some of the best weather of the year to enjoy life with your dog. The air is crisp and the breeze is filled with new scents that will get your dog’s juices flowing. Be sure and schedule some quality time with your best friend during this short-and-sweet season. New work schedules and kids going back to school mean that your dog may see less of you. Plan to take advantage of this season’s unique outdoor opportunities with your dog. Fall festivals, farmer’s markets, pumpkin patches and more combine social and physical benefits for humans and canines alike. It’s a good idea to brush up on your dog’s social graces before getting into public areas. Bad greeting manners and reactions to distractions are the most common complaints heard by dog trainers. Practice makes perfect, so snap on a secure leash and collar and start working. Brushing up on commands in your neighborhood will pay off when you get into a populated area. For a more bucolic outing, check out nature walks in your area that is dog-friendly. This type of outing is a treat for your dog’s senses, and his powerful nose will give him all the entertainment he can handle. Keep in mind your dog’s body type and plan a hike that doesn’t overtax him. Short-nosed breeds and smaller dogs don’t want to go as far as your long-legged retriever. Take some water for both of you and rest along the trail. Avoid unmarked trails to keep from getting lost, and bring your cell phone in case you need help. Falling leaves, decaying vegetation and ragweed pollen have many of us sneezing this time of year, and your dog can suffer from allergic reactions, too. Itchy, inflamed skin, raised bumps, runny nose, and redness in the eyes are likely symptoms of exposure to grass and ragweed pollen, which increases dramatically in autumn. If you see these signs after a woodsy hike or romp in tall grass, give your dog a soothing bath with a calming oatmeal or aloe shampoo. This washes off the offending spores that cling to his skin. Finish this neat treat with a towel rubdown, and your dog will feel better. Your veterinarian can do some allergy tests, if needed, and offer your dog some relief with medication. If your dog was free and easy over the summer, but now needs to spend more time alone during the day, he may experience Separation Anxiety. Some dogs become so agitated when left alone, that they chew furniture, woodwork and even themselves in frustration. 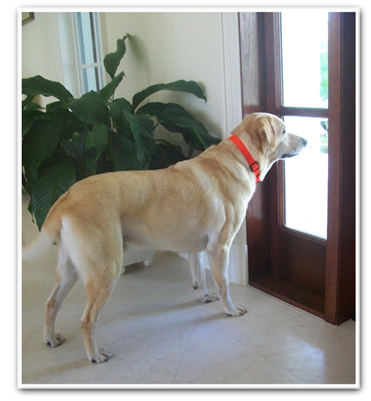 Help your dog adjusts to more alone time by creating his own special haven within your home. Dogs seek their own natural den. Your dog may choose space under a chair, table or desk to call his own. A pet crate or gated area complete with food and water, chew toys and a soft bed gives him his own personal space, safe and secure within your home. Toss in a few treats and watch him explore his new place. Plan to feed his meals and give chew treats in this area so he associates the confinement with the good things in life. Practice short absences at first, and be sure your dog is exercised and collars removed before putting him in his space, so he can relax until you return. Going back to school means, kids are busy with homework, sports and lots of demands on their time. Family dogs miss playing with the kids when school starts, but with some forethought, you can make sure your dog gets the family time he craves. Remember when your kids promised to do all the dog chores, including training, feeding, and walking? To get your kids interested in training, teach the dog an easy trick like “shake”. Kids will want to show this off again and again. Help motivate kids to pitch in on daily care tasks like feeding and walking by making a weekly job chart. All family members can volunteer for age-appropriate tasks so one person isn’t doing all the work, and mark the chart when the job is completed. At the end of the week, parents can offer rewards for a job well done, like movie passes or a favorite take-out meal. Shrieking kids, scary masks and lots of doorbell ringing may sound like fun for candy-loving humans, but it can be a real fright for our dogs. Every year the same safety warnings broadcast ways to keep kids out of harm’s way, but sometimes we forget to safeguard our pets on this noisy and unpredictable night. Halloween can be a fun opportunity to show off your dog’s cute costume. Just keep safety in mind for kids and dogs, so your night can be more kooky than spooky. Doorbell ringing agitates most dogs. During the most active trick or treat hours, limit your dog’s access to the front door. Costumed strangers shouting “Trick-or-Treat” and rustling large bags of candy may motivate your dog to protect his territory with aggressive barking. Is your dog slightly skittish? He may have the opposite reaction, and try to dart out the open door as you are handing out candy. Try a crate or gated area outfitted with a treat-filled chew toy and a comfy bed until rush hour is over. Confine cats to a bedroom and put on some soft music or the television to keep them purring. If you have an underground fence, you may be tempted to let your dog enjoy the evening air outside, but even the least territorial dog may react badly to costumed kids cutting through his yard. He may not recognize children he sees every day at the bus stop. Surprised kids may react by screaming and running away, a perfect excuse for your dog to succumb to his prey drive. Consider calling a couple of dog-owning friends and check to see if they want to come along. Dogs are happier with other four-footed company, and your kids will bag more candy with the added cuteness factor. Another fun option is a Halloween party. Kids can make a craft project out of making dog biscuits and stashing them around the house for your dog to find. Recipes are readily available, and the dog will savor the anticipation. Parties involving kids in costume will be tolerated only by the mellowest of family dogs, so know your dog’s limits. Kids do not always use good judgment when greeting dogs, and many are actually encouraged to hug and lay on their own dogs at home. If your dog is approached in this way by a child he doesn’t absolutely adore, he may react with his teeth, which conjures up a liability nightmare for you. We all know that chocolate is deadly for dogs, but foil wrappers and lollipop sticks can require an expensive vet visit, or worse. Kids should keep candy well away from pets, in a closed cabinet out of the reach of prying paws. If your dog looks a bit over-stimulated and overwhelmed by all the Halloween activity, it may be time to confine him to a safe area where he can sleep it off undisturbed and dream of the next food-filled holiday.